The renown of Tuscany among lovers of fine food and wine is rising just as precipitously as are prices in this part of the Apenine Peninsula. Italy is the largest wine producer in the world, with seventy-five million hectoliters emerging from its vineyards each year. According to EU guidelines it is included in Zone C – the southern states – and it is further divided into three zones. 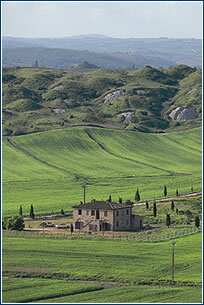 Tuscany is in the Mid-Italian zone, which also includes the Liguria, Ubria, Ambruzzi, and Campanila areas. But none of them receive such international acclaim for wine as does Tuscany. Everyone knows about ruby-red, zesty Chianti that comes from here, as well as noble, full-bodied Brunello di Montalcino. Tuscany lies roughly between the cities of Florence, Pisa, Siena, and Montalcino. This is where the most celebrated vineyards included in the DOC (Denominazione di Origine Controllata) category denoting provenance, and the even higher classification DOCG (Garantita). These wines were the first in Italy to receive this recognition – Vino Nobile di Montepulciano and Brunello di Montalcino. The most famed vineyard in Tuscany is probably Santa Kristina, which is shaped like a fish, and the local Sangiovese grape is said to be the best for making Brunello. There are over eighty thousand hectares of vineyards in Tuscany, lying in regions whose names themselves hold the promise of unusual experiences – Chianti Classico, Chianti Rufina, Brunello di Montalcino, Nobile di Montepulciano, Bianco di Pitigliano, Montefalco, Orvieto, Montefiascone, Cerveteri, and Montecapatri. The vineyards are picturesquely laid out on hillsides, dominated by lovely little towns, villages, and isolated settlements. Grape vines are cultivated here up to the elevation of 700 meters above sea level in rocky soil laced with shale, which gives the wines their characteristic mineral overtones. The most widespread varietal vine is Sangiovese, which yields the grapes from which the world-renowned Chianti is produced, and in 14 townships the cloned Sangiovese-Brunello, which is made into the famed, powerful Brunello di Montalcino. To a far lesser extent other varietals are grown here, such as Cabernet Sauvignon, Trebbiano, Malvasia, Gamay, Merlot, Sauvignon, and Chardonnay. Detractors claim that most of the Chianti the world consumes has only passed through Tuscany in tank trucks. Real Chianti can be produced in only 45 townships in Tuscany. Famed, true and expensive Chianti comes, for example, from the Antinori, Castello Querceto, Fattoria Cusona of Prince Strozzi, and Monsanto. The finest Brunello di Montalcino can be found in the cellars of Gaja, Villa Banfi, Conti Constanti Frescobaldi, Lisini, and Altesino. 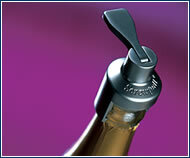 Keep your opened “bubbly” full of bubbles – with this screwpool pressurized stopper. CZK 1,200. June 6 – Wines of South America (incl. Uruguay and Mexico). Introduced by importer Vinicola. June 26 – Neubauer firm presents Italian DOC and DOCG wines from Veneto, Piemonte and Tuscany regions. Participation fee and voucher for 300 Kč. Tel. : 222 515 243. Probably every wine lover is fond of some vintage from Tuscany and will staunchly defend their choices against wines from the rest of the world. There are of course many more to be found, but here’s a selection to whet your palate. Characteristics: A pleasant, typical Chianti that some people are enthusiastic about and others rate as average. Its aroma and flavor are suggestive of ripe black cherries, and it goes excellently with pasta. Characteristics: A truly pure, classic Chianti from the finest vineyards in Tuscany. Full, harmonious, and elegant, full-bodied yet still pleasantly drinkable with a lovely, lengthy persistence. Characteristics: This thirteen-year-old Brunello is still glorious and fresh. Robust and full-bodied, with pleasant, sweetish tannins. Its flavor is a pleasant blend of honey notes with bitterish chocolate and a welcome spiciness. Characteristics: This is yet another thriving off-spring of the cooperation between Californian vintner Robert Mondavi and the high-born Italian Marchesi de Frescobaldi. It’s the younger sister of the well-known Luce wine, made from hand-picked grapes of the Sangiovese (43%), Merlot (43%), and Cabernet Sauvignon (14%) varietals from the Montalcino vineyards. A wine with an intense, glowing ruby color with the full aroma of ripe dark fruits and a fine spiciness on the palate.